In our last ARKit tutorial, we learned how to measure the size of horizontal planes. It was a helpful introduction to the arena of determining spatial relationships with real world spaces in comparison to virtual objects and experiences. This time, we will delve into a slightly different area that touches on another aspect of measurement in augmented reality. What will you learn? Swift 4.0. Although Swift 3.2 will work on Xcode 9.2, I strongly recommend that you download the latest Xcode to stay up to date. 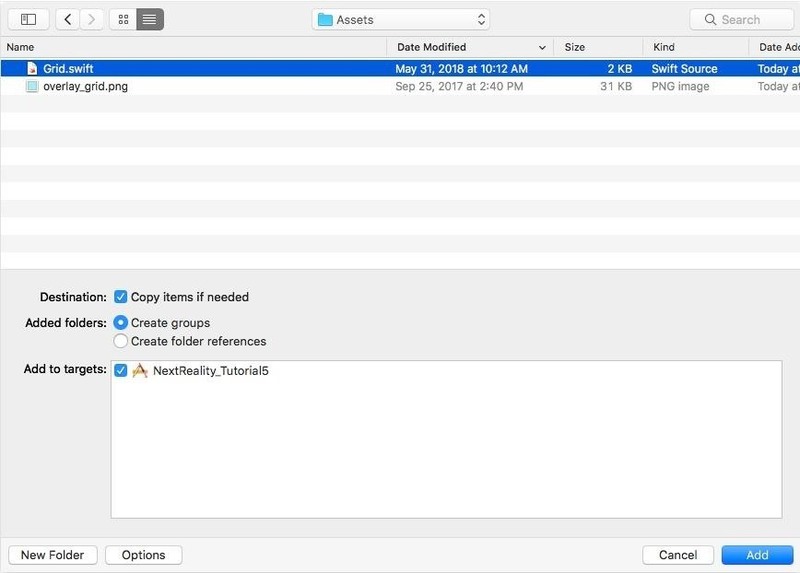 To help you understand this tutorial I've created a folder with the required 2D assets and Swift files that are needed for the project. These files make sure that they are not lost in this manual, so download the zipped folder containing the assets and unzip it. If you're not sure how to do this, follow Step 2 in our post to controlling a 3D layer with hitTest to yours AR project in Xcode. Give your project a different name. B. NextReality_Tutorial5 . Do a quick test before continuing with the following tutorial. In the project navigator, click the Assets.xcassets folder. We will add our 2D images here. Then right-click on the left area of ​​the area on the right side of the project navigator. Select "Import" and add the file "overlay_grid.png" from the unzipped folder "Assets". Next in the Project Navigator Right-click the yellow folder for "NextReality_Tutorial5" (or whatever you named your project to have). 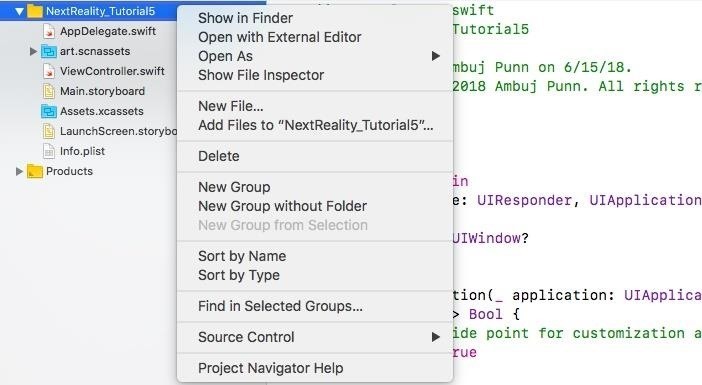 Select the option "Add files to & # 39; NextReality_Tutorial5 & # 39; s". 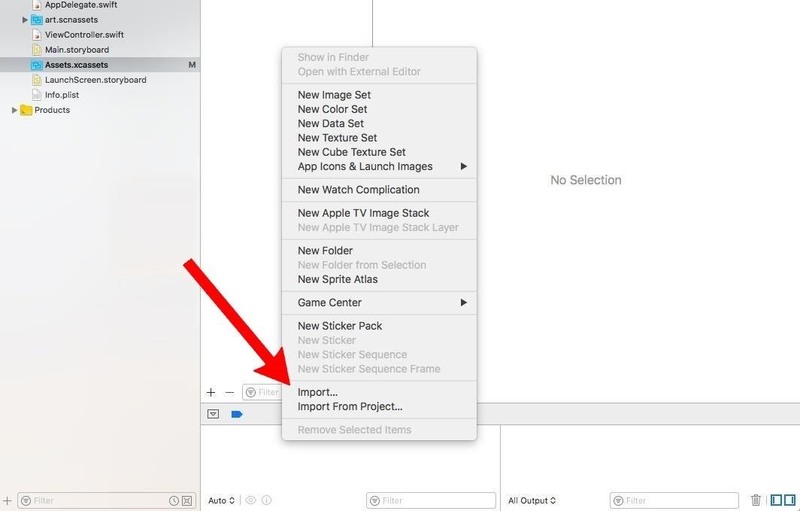 Navigate to the unzipped "Assets" folder and select "Grid.swift" "File." Be careful To copy need to "turn on and leave everything else as it is, then click" Add. " This file helps to create a grid for create any horizontal plane that ARKit detects. 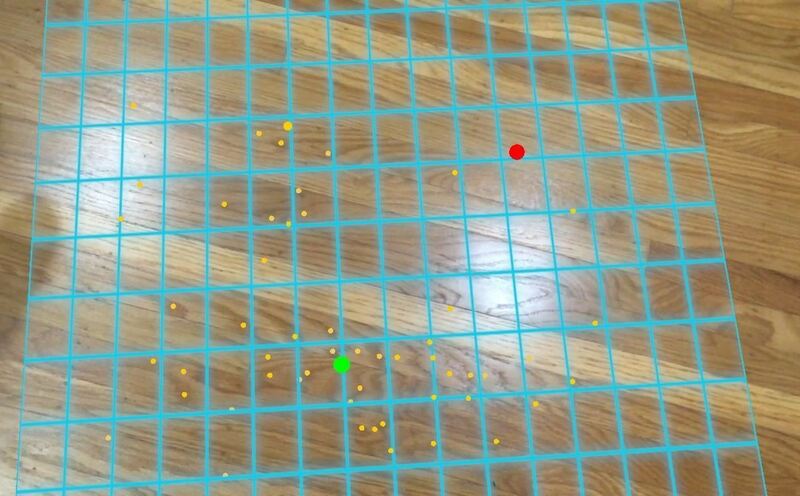 To quickly learn about ARKit's general detection capabilities, Take a look at our horizontal plane detection tutorial . Open the ViewController.swift class. Click on it. If you want to follow the final Step 4 code, just open this link to view it on GitHub. @IBOutlet var sceneView: ARSCNView ! Copy the following two methods, as below listed at the end of the file before the last curly bracket (} ) in the file. With these methods, we can add our grid on the horizontal planes, which were recognized by ARKit as a visual indicator. Let's talk quickly about what happens with these two methods:  The didAdd () is called when a new node is inserted into the ARSCNView . Here we take the detected ARPlaneAnchor and add it as our Grid object that adds the grid image we imported to each detected plane. The didUpdate () is called when newer ARPlaneAnchor nodes are detected or when the aircraft is extended. In this case, we also want to bring our network up to date and expand. We do this by calling update () to this special grid . This is very important ! This ensures that ARKit can detect horizontal, flat geometric planes in the real world. The feature points allow us to see all the 3D points that ARKit can recognize. When you begin this step, we strongly recommend that you review our [hitTestTutorial for the basics explain how the hit test works. In this step, we place start and end markers between our two points. If you want to follow the final step 5 code, just open the link to see it on GitHub. First add a gesture recognizer to the end of the viewDidLoad () method, as shown below. As soon as a tap on the screen happens, the method getapped () is called. Now add getapped () as shown below, at the end of the file, but before the last curly bracket (} ). Currently, this code translates only the 2D point tapped on the screen into a 3D point on a detected level using hitTest. We will come back to adding more features in a later step. In the above code, we made sure that a red marker was added if it was the first, and a green marker if it was the second. Next, we reset the variable numberOfTaps after the second tap to 0 so that new pairs of points can be added. Here our two methods addRedMarker () and addGreenMarker () call the helper method addMarker () to add both markers. In addMarker () we create a SCNSphere instance with the passed-in color and place it using the hitTest result to identify the point at which we tapped. In this step we will do some simple calculations to calculate the distance between the two added points last step, and use some SceneKit APIs to draw a line between the two. If you want to follow the final step 6 code along with just open the link to see it GitHub. endPoint = SCNVector3 (hitTest.worldTransform.column.3.x, hitTest.worldTransform.column.3.y, hitTest.worldTransform.column.3.z)  We simply store the values ​​of the hitTest result in these two variables for each marker. Here we add a custom functionality to SCNGeometry to allow us to draw a line from one point to another. This method inherits start and end points in the form of vectors ( SCNVector3 ) and adds the generated line in the form of SCNNode to the scene. In other words, we should now see a line between our two points! Here we add two extensions. The first is to add custom functionality to the [SCNVector3 type by allowing us to calculate the distance between the two points using the distance formula. The second feature adds custom functionality to the float type, allowing us to convert meters to inches. This method simply outputs the distance between the two points next to the endpoint. Good work! 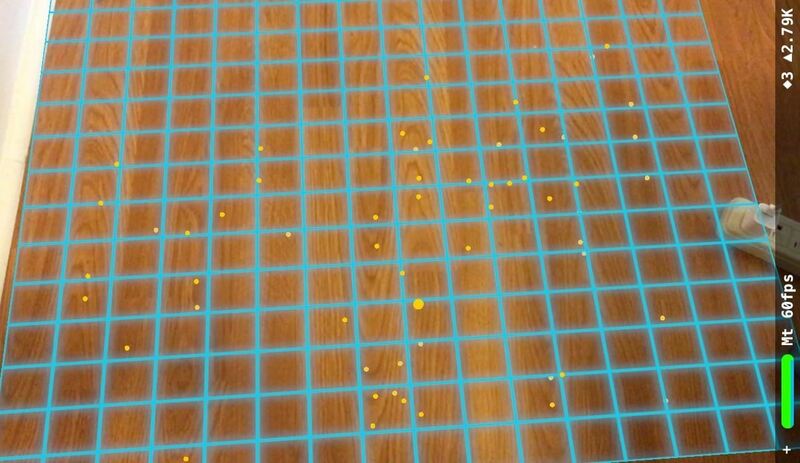 You have successfully learned to measure with ARKit between two points on a horizontal plane. The next time you want to measure a flat surface, use this created app instead of a tape measure. Let's talk about the tutorial: placing a grid over a recognized horizontal plane with the hitTest to create the start and end markers for both points, and creating a custom extension to calculate the distance between the two points and draw a line between them. If you need the full code for this project, you can find it in my GitHub Repo. I hope you liked this tutorial on ARKit. If you have comments or feedback, you are welcome to leave it in the comment section. Happy coding!